Weni Solution 3015FM SERIES – Weni Solution 3015FM SERIES- A new professional model of laser cutting machine with a spindle (attachment) for cutting pipes and profiles with a length of 3m or 6m. The working area of the platform for sheets is 3000x15000mm with laser power up to 6000W. Characterized by high speed and the best parameters. The control system is located in a separate free-standing cabinet, so it is not exposed to damage and disturbances related to the operation of the device and also makes operations much easier for customer. All axes are driven by the latest Schneider servo motors, which are characterized by high accuracy and very high durability. The device includes an efficient laser, auto focus, stable CypCut software with NESTING function (automatic optimization of project placement on the material), dual cooling system, voltage stabilizer, lubrication system and dust extraction system. Designing of heavy construction, made of high-quality metals alloys and submiting device in the process of long-term and special treatment removes resulting strains in the material , significantly reduces vibrations, shocks and shakes, making the FM series characterized by high stiffness, stability and shock resistance,and the processed materials retain the given parameters. Model 3015FM is highly advanced device intended for customers with high-volume production. All Weni brand fiber lasers are equipped with Auto Focus as standard. This function can be used for different focal lengths which are controlled by laser control system. The focal point will be automatically adapted in the cutting process in order to achieve the best cutting effect of metal sheets of different thickness. In practice it means the change of thickness of the processed material by the operator, without re-setting the focal length manually. We do not need manual adjustment. The focal length is controlled by the operating system which effectively prevents the errors or failures caused by manual operation. .
Increasing the focal length of the perforation. Separate setting of focal length of the perforation and focal length for cutting makes the cutting more precise. Auto focus. Automatically adjusts the most proper focal points in the process of trimming and cutting which greatly improves the speed of cutting. The FM series operates the length of pipes and profiles up to 6000mm, where after process only 15cm of material is left for Φ > 80mm in the rear clamp. 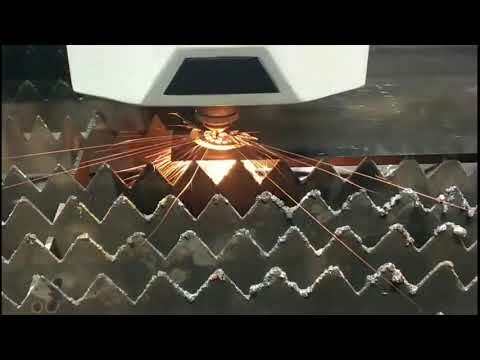 The device uses the most accurate possible cutting methods, material guidance and control system. The material is attached by means of a sliding rear handle and guide front handle. The clamps in the spindle holders are pneumatic, which significantly speeds up the loading and handling process.